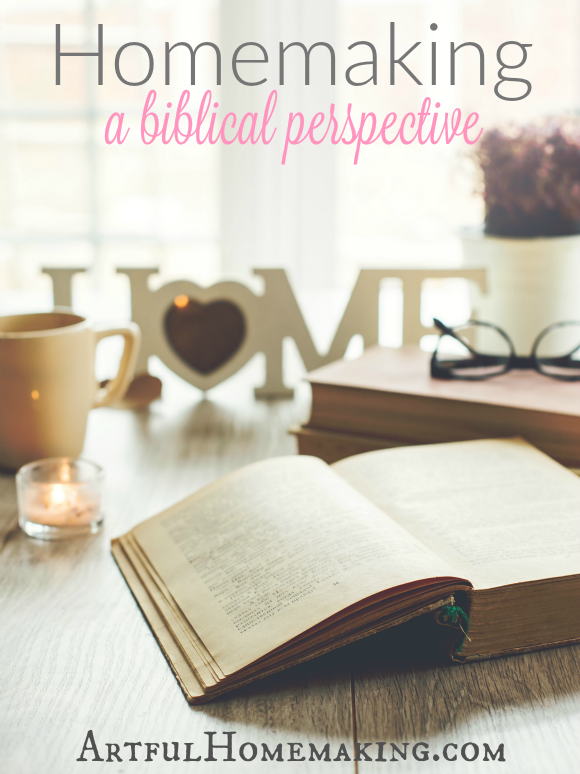 A Biblical view of homemaking taken from the Bible and quotes from favorite authors. We must have biblical convictions about why we do what we do. I think this especially applies to homemaking. Without knowing what the Bible actually says about it, we can start to think of it as a burden rather than the blessing it was actually meant to be. Homemaking is so much more than just doing laundry, making meals, and decorating. It’s really all about creating a place where family and friends can encounter truth, goodness, beauty, and a sense of belonging. It’s about showing the love of Christ to all who enter our doors. Put simply, the verses in Titus imply that married women are to be keeping house and making sure things run smoothly there (whether they work outside the home or not). Even though we take full ownership of all the domestic duties, that doesn’t mean that we do all the work ourselves! It’s perfectly acceptable (and needful) to have other family members working together to keep the home running smoothly. And it’s totally fine to get outside help if you need it and can afford it (as Proverbs 31 implies that this woman also had “maidservants” or helpers). I think the main thing is just that we’re putting thought into planning and executing our homemaking duties. I decided to prioritize what was most important on my list, and then ignore the rest for now. Many of the projects I had listed weren’t time-sensitive and they could wait. However, I’ve realized that I don’t have time to waste (although I do think it’s important to take time to rejuvenate yourself as a homemaker). Homemaking is such an important job. It’s not easy, but it’s so worth it. And it’s not only for married women! Isn’t that a beautiful picture of what we do as homemakers? “Painting the reality of God onto the walls” of our homes lifts up the higher purpose for all that we do. All of the work of homemaking is so worthwhile and beautiful when you look at it from a biblical perspective! Disclosure: This post includes my affiliate links. Read my full disclosure here. Thank you so much for this lesson. That verse is so beautiful . My girls are all grown up and have their own families now and it is just me and Honey . But taking pleasure of keeping my home is what I need to focus on .I am so thankful that I came across your page . God bless you . I’m so glad you stopped by, Cindy! What an blessing to be a homemaker! I wish I had realized what a place of honor it was when my children were little. They're all grown and away at Bible college now but if I could turn back the clock. Well, i can't but I'm thankful for posts like these that will encourage other ladies to hold in high regard the office God has placed them in. Thanks for the nice read.